Cawdor Quarry is a disused quarry in Matlock, the overall site occupies an area approaching 400 hectares and borders the River Derwent. The site was contaminated with waste materials from historical activities. Part of the site was purchased by Sainsbury’s in 2000, with view to build new supermarket. Following local pressure, the scheme was amended to incorporate the existing A6 Bakewell Road being diverted across the River Derwent and run through the site on the embankment that forms the south bank of the river. The diversion of the A6 included the construction of a new bridge across the River Derwent along with the realignment of the existing railway and also the construction of the embankment for the carriageway which tied into the existing A6 at Dale Road on the outskirts of Matlock. Sainsbury’s also developed the existing Station Yard and Matlock Bridge car parks to create a new town centre car park. The existing town centre bus station was also relocated to the area. Main contamination sources identified at the Cawdor Quarry site, were Polycyclic Aromatic Hydrocarbons and Total Petroleum Hydrocarbons. 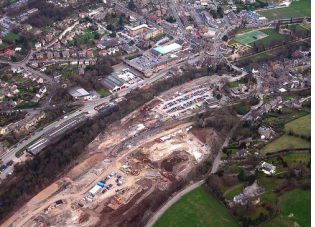 Envirotreat were initially commissioned with the remediation of contaminated material from within the bypass, rail and bridge development areas, once remediation had commenced Envirotreat were also requested to address the remediation issues associated with the supermarket development. Giffords evaluated numerous remediation strategies and found the Envirotreat ex-situ stabilisation / solidification process as not only being the most cost effective strategy, that it also addressed all the contamination issues in a sustainable manner which allowed re-use of all material on site. The E-clay® designed specifically for the Cawdor Quarry site was a modified pillared inorgan-organoclay, formulated to treat the identified main contaminants of concern. The E-clay® formulation primarily focused on the effective treatment of TPH and PAH.